John Peter Russell was an Australian painter of impressionist landscapes and seascapes in oils and watercolours. John Peter Russell (16 June 1858 – 30 April 1930) was an Australian impressionist painter. 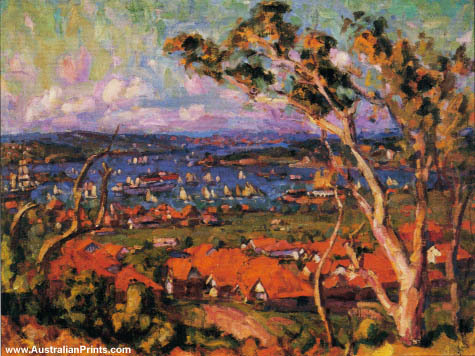 Born and raised in Sydney, Russell moved to Europe in his late teenage years to attend art school. Russell befriended fellow pupil Vincent Van Gogh, and painted the first portrait of the future world-famous artist, now held at the Van Gogh Museum. A painter of impressionist landscapes and seascapes in oils and watercolours, Russell was fortunate to be born into a wealthy family and was able to indulge him in his two pleasures, painting and travel. After the death of his father, Russell inherited an annual income of about $6000 and left for London, travelling on the same ship as Tom Roberts. In London, Russell attended the Sale School and later in Paris attended the Cormon Studio where he met many of the now important young radicals including Van Gogh and Toulouse-Lautrec. 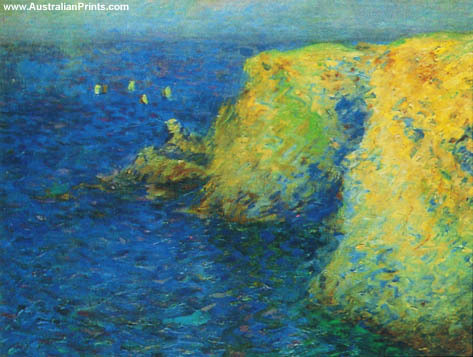 Russell returned to Australia in 1923 without much acclaim; it has only been in recent years that due notice has been given to the significance of his work. His works are held in major galleries in his home country and in Europe. Artist information page for John Russell. This article uses material from the Wikipedia article John Russell, which is released under the Creative Commons Attribution-Share-Alike License 3.0.